David Gordon Lyon and students of the American School of Oriental Research. Harvard University’s Semitic Museum, lately undergoing an exciting resurgence, was founded in 1889 by Professor David Gordon Lyon. A southern Baptist from Alabama, Lyon was a charismatic scholar of ancient Mesopotamian scripts, and one of Harvard’s more dynamic and vital figures in the late 19th and early 20th centuries. The Semitic Museum’s focus is the Near East. Most of its 40,000-odd objects were obtained during museum-sponsored excavations in Egypt, Iraq, Israel, Jordan, Tunisia, and Syria. As both the intellectual driving force behind the Semitic Museum and its first director, Lyon shaped its special character over many decades. So it’s fitting that, as the museum continues a rejuvenation begun 18 months ago, it should devote a special exhibition to his legacy. Lyon came to Harvard in 1882. He taught Hebrew and various other ancient near-eastern languages — Sumerian, Babylonian, Akkadian, and so on — and became the first Professor of Assyriology in the US. A persuasive, galvanizing figure, he cultivated a community of like-minded people, and in 1889, he astutely befriended a New York businessman, Jacob Schiff. Schiff provided the money that helped Lyon establish the Semitic Museum, which for several years operated out of a single room in the Peabody Museum. It finally opened in its own building, across Divinity Avenue, in 1903. This exhibition, conceived by Peter Der Manuelian, the museum’s current director, and organized by curator Adam Aja, with assistance from curator Joseph Greene and Manuelian, takes up just one room of the museum’s second level. But it is a room packed full of beautiful objects, all of them connected to fascinating stories. The experienced exhibition designer Virginia Durruty has deftly transformed the space for the occasion. Perhaps the first thing anyone who enters will register is the extreme, at times almost bizarre, diversity of the material on display. All these objects came to the museum from the lands in which Lyon was interested, ranging from Egypt to modern day Iraq, and the Levant. There are three wooden mummy coffins from Egypt, a door jamb from the Great Temple of Amun at Karnak featuring an incised image of the Egyptian pharaoh Ramses II, and an array of smaller Egyptian objects. But there is also a case devoted to Mesopotamian texts, including cuneiform tablets and cylinder rolls. Another case holds a wild miscellany of pottery dating from the early middle Bronze Age to the Islamic period, with examples of Persian, Hellenistic, and Roman vessels in between. Many still carry pungently evocative deposits of dirt. There are glass cases devoted to weapons and implements (a blunderbuss, a shepherd’s club, several daggers), food and music (a tambourine, a brass pitcher with elaborate silver inlay), and clothing and jewelry. This dizzying range, as much as any of the individual objects, reflects back on Lyon: his sheer intellectual bandwidth, and his impressive ability to see — and sometimes, admittedly, to concoct out of thin air — threads connecting everything. Lyon thought of all the territories from which these objects came as Biblical lands. 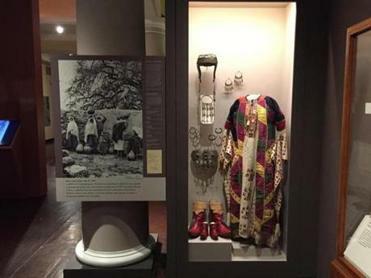 (At one point he even considered calling the museum the “Biblical Museum.”) He collected contemporary ethnographic objects (clothing, musical instruments, tools, and so on) in the belief that they were in some ways representative of life in the Ancient Near East. Scholars have since realized that there was much less cultural continuity across the centuries and millennia than Lyon imagined. But the items he collected add enormously to our sense of the Semitic Museum’s formation — and also, of course, to the romance of archeology during this pivotal period in the rediscovery of the region. As a scholar of languages, Lyon settled on “Semitic” as a designation for the museum because it denotes not just a family of languages, but also the ancient histories and cultures of the people who spoke them. The first thing that will register is the extreme, at times almost bizarre, diversity of the material on display. Many of the objects in the show, such as a pair of Egyptian coffins — one designed for a woman, the other for a man (probably her husband) — and the limestone canopic jar, used by ancient Egyptians to hold internal body organs, have their own special charisma. Many others — including the cuneiform tablets and cylinder seals — carry a surprisingly visceral charge. You may not have the expertise to translate them, but to see such early examples of writing in such concentrated quantity is thrilling. Some of the exhibition’s most moving items relate more directly to Lyon. There is, for instance, near the beginning of the show, a case holding an open field journal from 1908, when Lyon was at a dig in Samaria, in Palestine; and also one of the 38 diaries he kept, one a year, for almost four decades. 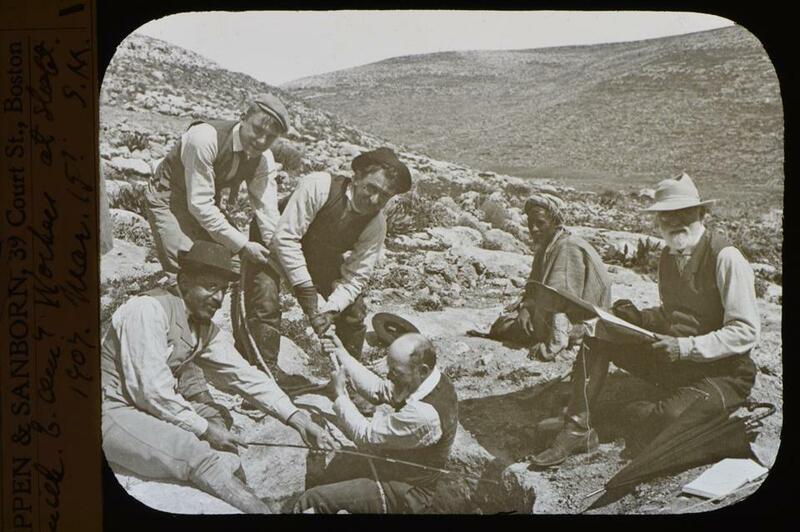 These diaries recorded daily details of excavations Lyon participated in or visited in Samaria and in Egypt, as well as his interactions with key figures such as Harvard University President Charles Eliot, and George Reisner. The latter was Lyon’s star pupil, who went on to head up the great Harvard/MFA archeological expedition, which ran from 1905-42. The show also includes a blown-up blueprint for the museum building itself, a box of glass lantern slides, and a large screen displaying, in slideshow format, some of the actual photographs Lyon took on his travels. These are captivating, transporting us instantly from the clinical and stately preserve of Harvard University to a completely different time and place. We see water carriers and dancing women at Luxor, whirling dervishes in Cairo, the Lord Mayor of Hebron and a group of men in Ramallah. We see a barber, a bread seller, a young man plowing, and an Ottoman officer with two soldiers under his command. The photographs themselves are crisp, artful, and sensitive — a real revelation. Lyon formally retired from teaching in 1922, but remained involved with the museum until 1931. If he doesn’t quite come into focus as a person here, that’s because his legacy, the objects he acquired for the museum, and all the fascinating scholarship that fans out from them, are still front and center. And that’s no doubt just as he would have wanted it.